(August 16, 2012) The aftermath of a terrible storm that brought China’s capital to a standstill in July, has left Beijing pockmarked by sinkholes. The city’s grossly deficient infrastructure and Soviet-era drainage system turned a deluge into a deadly downpour and brought on a sinkhole scourge. The root cause? Chaos in Beijing’s civil administration. The next time you go for an evening stroll along a Beijing street after a heavy downpour, it might be wise to carry a rope and pickaxe to help you should you stumble into one of the city’s growing number of sinkholes. Sinkholes are hardly a new phenomenon to Beijingers, but nearly 100 have formed in the aftermath of the July 21 storm. Chaoyang, Chongwen, Fengtai and Haidian districts have all been peppered with sinkholes caused either due to extreme weather or subway construction. The geological hazards often form without warning and while several vehicles have been devoured in Beijing by sinkholes, no one has been killed. The swelling scourge of sinkholes has put many people on edge in Beijing. Chen Zhejiao, a 25-year-old saleswoman, told Metro Beijing she now feels “uncertain” about her own safety while walking on the street. Li Xiao, a 32-year-old real estate agent, said he’s eagerly waiting for the results of government investigations into the sinkholes. But until then, rumors seem set to continue regarding links between human impact and their cause. Sinkholes have proved a hot topic of debate online, with search results for “Beijing sinkhole” generating 3.7 million posts on Sina Weibo, China’s most popular microblogging service. Many people commenting on sinkholes share their fears over personal safety as well as the environmental repercussions. A representative from the center surnamed Gu confirmed with Metro Beijing that so far 99 sink holes have formed in Beijing’s urban areas since the July 21 storm – an average of four daily and a 66-percent increase year-on-year. “Our staff members are working to fix them,” said Gu, who declined to reveal how many sinkholes had formed from underground water being exhausted. 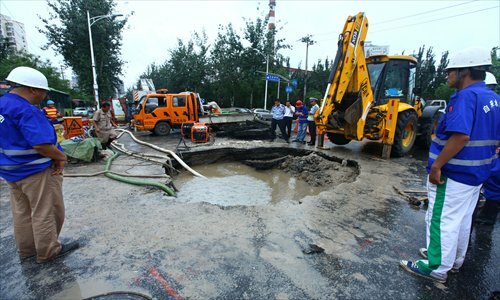 Duan Jinping, a publicity officer with the Beijing Geology and Mineral Resources Exploration and Development Bureau, told Metro Beijing that failure in the construction of roads was the major cause of sinkholes. But not everyone agrees with Duan’s assertion. Yang Chengyong, a municipal engineering professor at Beijing Jiaotong University, argued that the construction method for roads isn’t to blame, rather poor drainage is. Yang didn’t end his criticism with the city’s sewer network, saying other projects such as extending subway lines were to blame for the rise in sinkholes. “Underground construction of Beijing is endless,” said Yang. “This often leads to leaks in water supply as well as from pipes, which can also wash soil away,” said Yang. Yang pointed out a better drainage system in Beijing would effectively avoid the formation of sinkholes in the future. One measure Beijing has taken in the wake of the July 21 storm has been authorities’ announcement to build 20 underground flood pools in the city’s downtown area to improve the capital’s flood-control capacity. The flood pools are slated to be built near low-lying traffic passages most at risk to flash floods. Many of the existing passages are dilapidated and are frequently inundated during heavy downpours, Beijing’s water supply bureau admitted on August 12. This might be a welcome underground project that could alleviate sinkholes, but another project set to continue is construction of Beijing’s ever-expanding subway network. Yang blamed the latter’s “chaotic management” for triggering many sinkholes. One of the most severe sinkholes to hit Beijing this year formed on April 26 on Shiliuzhuang Lu, Fengtai district. The 20-meter-deep sinkhole formed beneath a truck, injuring the driver and a passenger who both jumped out the vehicle before it was devoured by the hole. Construction beneath the road for an extension of Subway Line 10 was blamed for the sinkhole by some locals, however engineers said it was most likely caused by water leakage from old pipes underground. “Beijing has no integrated underground construction plan, which can make simple projects very difficult,” said Yang. “Today there are many underground projects for utilities and public works including electricity, communications, heating, drainage and water. Sometimes the same location is excavated many times by different departments, which often causes leaks. “The sinkhole issue isn’t a technical problem, nor a quality one. Beijing needs an integrated underground construction plan and cooperation from all departments to solve the sinkhole issue,” he added.